This just broke my brain. That is not a flat iron. That is not a Chi. Drying clothes happens inside a house, not near trees. Serious planning and diagramming was involved to just DRY CLOTHES. The woman on the right looks quite vexed, like an angry cat. She needs a box of wine. And check out the master of coat hanger origami. Oh, my poor grandmothers! I haven’t hung stockings/hose to dry this century. Does anyone wear pantyhose any more? Is metallurgy required? Does anyone even USE WIRE HANGERS? I sure as H do not. I saw Mommy Dearest. I’m no fool. And what on earth is this? I can do both the Mashed Potato and the Twist, but not in a bowl of pajamas. What kind of female McGyver was the housewife of yesteryear supposed to be? She was too busy making avocado melon Jell-O molds to dabble in repurposing kitchen utensils. Ain’t nobody got time for that. I am older than you, but not that, Kerbey. Until I read this and realize that I have hung plenty of clothes to dry on an outside clothesline as a kid, and even as an adult. (Though not here living in a neighborhood of Syracuse city proper.) The clothes come off the line a little stiff and you have to inspect for nasty clothespin corners as you fold, but they smell pretty boss (see my age there?). 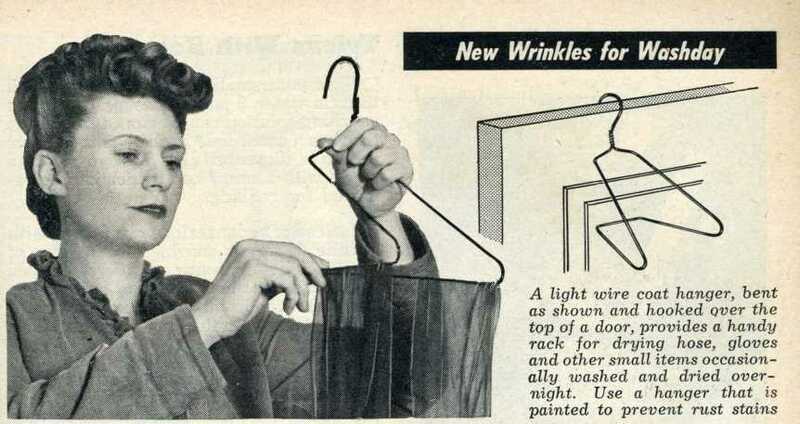 I use wire hangers, as does my dear wife Karen. Do you have trust issues, my friend? Wire hangers leave indentions in the shoulders of clothes. They should only be used for dry cleaning. I need thick rounded hangers on which to put my clothes. I did have to hang laundry until I went to college, but never in such a tiresome manner. And when it rained, how frustrating! It actually used to rain back then. I therefore have indentations in the shoulders of all of my shirts, Kerbey. No wonder! It used to rain in the good old days. Dang. I wish you had them back where you live. About clothesline drying – when I was pretty young, I liked to take a walk to visit my grandmum on varied Saturdays. She was old-school, If the weather was nice she’d always dry the laundry on the outside line even though she had a pretty nice dryer. Of course there was some work involved, e.g. she made it a point to stress that one should always shake each piece to make sure there were no insects on them before folding. The thing I remember the most though was the smell. I’ve tried nearly every dryer sheet that claims to have that fresh air scent but I’ve yet to find one that can match. I guess those are the simple pleasures that fade away as the years go on. Great memories! You wouldn’t want insects folded inside them for a nice surprise! Fresh air is the only true fresh air scent. True as can be, Scout! Well you have to admire the innovative spirit of the American Housewife. I do not understand why the term housewife is considered derogatory. Maybe I am too old to understand the hipness of family life. I remember some of this stuff, first hand. Sorry I like wire clothes hangers. They make great car lock picks. Well on second thought maybe only on older models. Heck I still use a hand potato masher. I like them better than machines. Unless you need to make a few hundred orders. My brother stresses that one should always have a few wire hangers in the trunk of the car. He’s a very handy sort of guy and says you never know when you’ll need one. One day, after having too long neglected to replace the pipe on my exhaust, it disconnected and scraped the street as I drove. Fortunately, my brother was with me. He went to the trunk and took out a wire hanger that he had put inside my emergency kit without my knowing. He got under the car, hooked the pipe up somehow with that hanger and we went straight to the shop for a replacement. Since then, I’ve learned that wire hangers are very useful for lots of stuffs. There’s a lot to be said about that old-fashioned innovative spirit – for the most part, we in the modern age have been spoiled by all of the technological wonders that are taken for granted. Imagine something like a super-powerful solar EMP surge that took out all electronics in a given area – I doubt that very many folks today could deal with such a thing. Everything, from washing and drying clothes to mashing potatoes would have to be done old-school, at least for a time. So many people would be so lost on what to do. I agree with you there. Evidently wire hangers can be used for most anything except hanging clothes. Ha! KERBEY, I had a roommate who became irate when she saw me putting a shirt on a wire hanger…’no wire hangerrrrs…!’ If you’ve seen Mommy Dearest I think you’ll know why I laughed hard. That’s what I always think of when I see them, and that’s probably the one thing I agree with Joan Crawford on. Not to be picky but you said that you had not set hose ” to dry this century.” Which means that you may have done it just 15 years ago. In fact this millenia, would also only be 15 years ago. See, you’re not as out of style as you may think Kerbey. i think you’d look fine hanging out clotes -getitng fresh air and exercise. Just think how healthy that would be. I’ll save a copy of this and pass it along to my next girlfriend. Definitely a helpful primer for doing the laundry. I personally like the potato masher – repurposing is a great way to get women involved in the household processes. 1989/90 was the last time I hung laundry. I haven’t hung hose to dry probably since the 90s. I just tossed them in the washing machine and crossed my fingers in later years. I do admit to hanging brassieres on the sides of the shower stall, so that they do not lose their cup form. Why can’t we just mash potatoes with mashers? Pretty clever ideas. 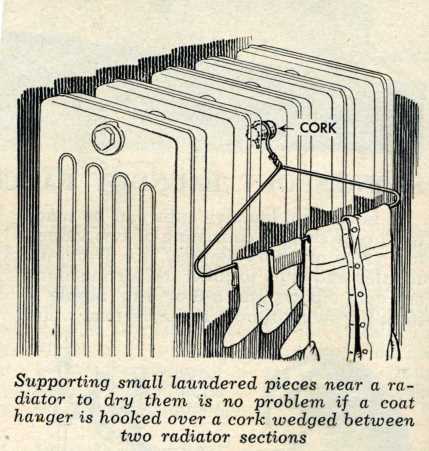 The next time I run across a radiator I’ll be sure to grab a cork and hang something from it. It would behoove you. Although it’d be easier to just turn a trick at the local brothel and buy a dryer with the sin money. That’s how I got my cookware. Don’t know if I can use that scam again. 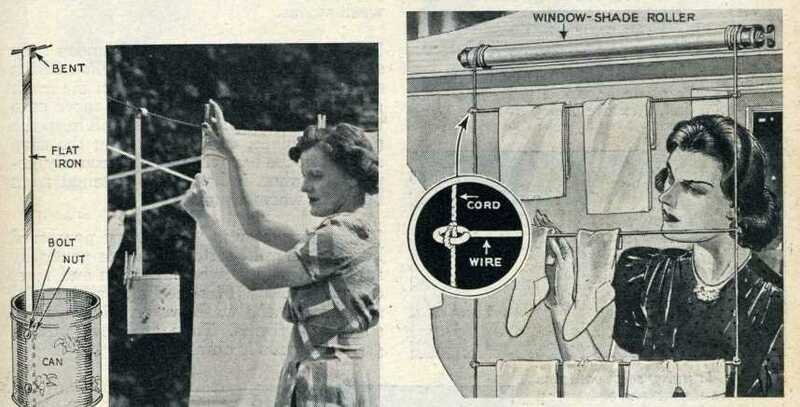 LOL – these are the lifehacks of yesteryear. So glad I don’t have to iron clothes regularly. 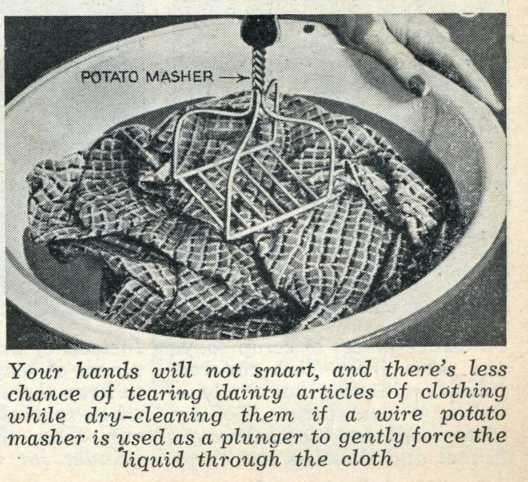 so you could possibly tear dainty articles of clothing using your hands in the cleaning process, but this will not happen if you use a potato masher? And what are we dry-cleaning the clothes in? A toxic solution that would make your hands “smart”? The potato masher does not do double duty in the kitchen, I hope. Am glad I am not a housewife of yesteryear, but I am also not a good housewife of todayyear. Even easy cleaning seems like too much work. There are so many other things to do, like reading and commenting on blogs. 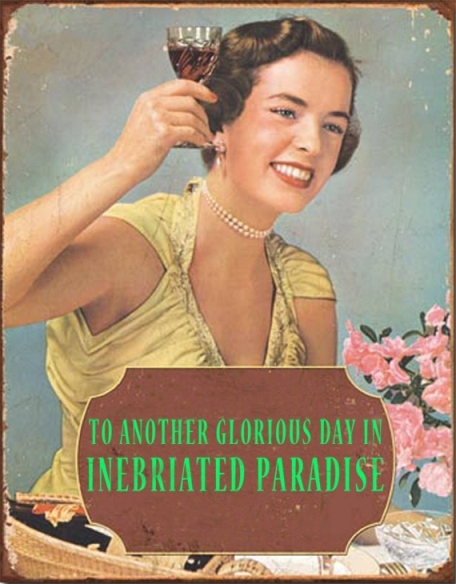 I hear you, wondertwin of todayyear. That’s my new favorite word. Much better than hangry. Please make a word for when I’m so angry that I’m sober. I’m usually that. I agree with your observations: you wouldn’t want to be making loaded mashed potatoes and then realize you forget to rinse the lye off your masher. was going to suggest “sangry,” but sounds like a lovely Spanish wine-and-fruit concoction, yes? How about stone-cold angry? Sto-co-angry? Now I just want sangria and am even sadder than before. I had a glass of Moscato before supper 🙂 Thought of you! We will share a bottle of Moscato one day. Indeed we will. And then we will share just one more just to be sure.